With over 45 minutes of accompanying online videos, this book is a valuable learning tool. Authors Angela Mabray and Kim Otterbein demonstrate all the essential techniques used for crafting with polymer clay. Angela Mabray lives in Yukon, Oklahoma, where she is a co-founder, frequent teacher and active member of the Central Oklahoma Polymer Clay Guild. She is also a member of the International Polymer Clay Association. She has written several articles for Polymer CAF\u00c9 magazine and has been filmed for HGTV\u2019s \u201cThat\u2019s Clever\u201d show. 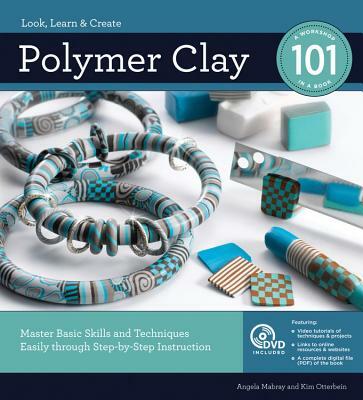 Her blog, CraftyGoat\u2019s Notes (http://blog.craftygoat.com), is filled with step-by step tutorials and videos that are popular with polymer clay enthusiasts around the world.Angela Mabray first happened upon polymer clay in a toy store. While she quickly realized it wasn't just for kids, she still feels a childlike joy each time she finds something new to do with polymer clay. Angela lives with her husband and son in Oklahoma, where she co-founded the Central Oklahoma Polymer Clay Guild. She is also a member of the International Polymer Clay Association. Her polymer clay projects have appeared in Polymer CafS, on HGTV's "That's Clever" show, and on many blogs. She writes about polymer clay at www.craftygoat.com.Kim Otterbein has had a love for beads all her life and still has a baggie of seed beads from the 1960's. Kim's training as a textile designer and painter seems to blend right in with jewelry making. Kim is the primary teacher for classes and workshops at the Bead House in Bristol, Rhode Island, sharing her wide range of knowledge and experience in beading, knotting, wire wrapping and polymer clay. She is a certified instructor of Precious Metal Clay (PMC) and also a silversmith. She has had many projects and instructional articles published in various magazines, including Bead & Button, Belle Armoire, Art Jewelry, Beadwork, Polymer CafS, and Lapidary Journal. To see her work, go to www.thebeadhouse.com and click on KO Design.